The Ulysses Butterfly is one of the most beautiful butterflies in the world. It’s striking iridescent blue color can be seen well over one hundred meters away (110 yards). Unlike the Cairns Birdwing Butterfly, the Ulysses Butterfly is quite a flighty butterfly and will fly in a random pattern in search of food. The Ulysses Butterfly will only land for a few short seconds and then it will set flight again. It will likely return to the same flower bunch using it’s proboscis to draw nectar and then it will be off again. I have taken all the photos in this article and it was difficult to capture this flighty Ulysses Butterfly. The butterfly landed on the yellow Bougainvillea flower bunch quite a few times and I had to be patient to get the right shot. When you are trying to capture butterflies on camera it’s best to have your camera settings on rapid photo mode. 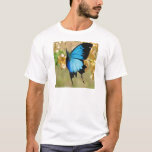 The Ulysses Butterfly can be found in coastal regions of tropical northernAustralia. 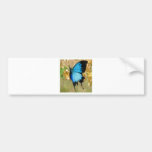 This butterfly can also be found in tropical Asian countries. 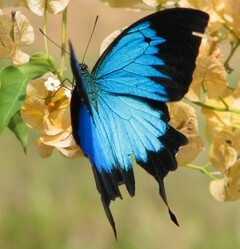 There are quite a few different varieties of the Ulysses Butterfly which is also known as the Blue Mountain Butterfly. The Ulysses Butterfly is attracted to the pink flowers of the Corkwood Tree. The Corkwood tree is also known as Euodia (sometimes misspell or pronounced as Evodia) or by its scientific name Melicope elleryana. The Corkwood tree can grow into quite a large rainforest tree so it might be unsuitable for your backyard. There is a smaller alternative that you can plant in your backyard to attract the Ulysses Butterfly and it is the Little Euodia or scientifically known as Melicope rubra. The Ulysses Butterfly will be attracted to the flowers of this plant and it will lay its eggs for its green and white spotted caterpillar to eat the leaves. Notice the structure of the Euodia Tree in the photo above? The trunk and branches are free of foleage. The leaves of the Euodia Tree are on the outer branches, the flower bud and bloom on the inner section of the tree. This open heart of the tree gives the Ulysses Butterfly an open and protected area of the tree to go about its feeding when the Euodia Tree is in bloom. You could also try to find and plant the beautiful Saracca or Saracca thaipingensis in your garden to attract the Ulysses Butterfly. This medium growth tree displays a beautiful blush of amazing orange/yellow flower bunches all the way up its trunk. The Saracca is native toAsiahowever it has been cultivated to tropical areas. 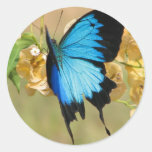 The photo below is a close up of the beautiful blue colour on the back of the Ulysses Butterfly. 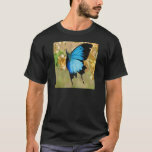 This colour is so striking against the black edges of the wings of the butterfly. When this butterfly is flitting around your back yard it’s hard not to stop and take notice. Notice in the photo above that the underside of the Ulysses butterfly wing is quite dull and has shades of brown and black. This dull colour ensures the Ulysses butterfly remains camouflage in its surrounding amongst the trees, leaves and tree trunks while it is at rest. The dull colour on the underside of the Ulysses Butterflies wings keeps it hidden from predators. Ask your local nursery if you are able to order in any of these plants to see if you can attract the Ulysses Butterfly into your garden. If you live in tropicalAustraliathen make sure you contact Yurunga Nursery who is one of Australia’s native plant specialists. I was quite excited when we recently moved house and was told by the owners about the 2 well established little evodia trees. I have now been told by someone that sells native trees that the ulysses butterfly is attracted to the pink flowers but cannot lay it's eggs in this tree as it's poisonous to the eggs. The butterfly can only lay it's eggs on the large evodia tree. Is this true?? wonderful article! lucky you to be able to see this beautiful butterfly! 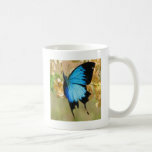 Stunning photos of this bright blue butterfly!! And it is on a very interesting tree. I'm so glad I found this page. 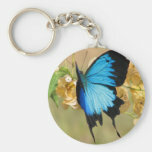 Great photos and you have given me some ideas of what to do with my butterfly photos. Fantastic shoots! Beautiful butterfly too.